You may have noticed lots of blogs and websites using small buttons similar to these. These services use a technology called XML to allow websites to distribute their content beyond the confines of the pages of the site. They make it possible for users to subscribe to websites to receive updates either via email or via a news reader. They also allow the content to be bookmarked, aggregated or packaged into widgets and displayed on other websites. A podcast is a special type of RSS feed that contains links to audio files. You subscribe to podcast in much the same way as you subscribe to plain RSS feeds. Enabling feeds allow the readers of your website to be kept up-to-date with your latest web content without remembering to return to your site. By subscribing to blogs and websites of interest with a news reader such as Google Reader visitors can follow as many blogs as they wish all from one place. For the website owner it enables visitors to subscribe to your website which should encourage users to return more frequently. Using a tool such as FeedBurner you can also give your readers the option of subscribing via email and you can begin building a subscriber list. From the advertiser’s point of view distributing your latest content via RSS bypasses SPAM filters that usually affect email broadcast, it also enables you to display adverts on the actual feeds themselves. How do I get a Feed for my Website? If you own a blog already there is a chance that you already have an RSS feed enabled on your website. Popular blogging platforms such as Typepad, Wordpress or Blogger publish feeds automatically. There are also tools such as FeedBurner that enable website owners to gain useful information about feed subscribers as well as lots of free ways to advertise and market your feed. How do I Start Reading Feeds from my Favourite Sites? There are many ways to subscribe to feeds, sometimes these tools are called news aggregators, some are installed on your computer whereas others are web-based services, and the good news is lots of them are free! 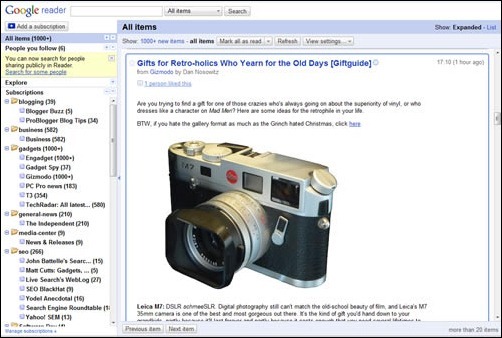 Many news readers use an interface similar to an email inbox with each blog post appearing in a reading pane. The posts are listed in chronological order and you usually have the option of selecting all the latest content or content only from certain sites you subscribe to. Click here to find a suitable RSS feed reader.